Ovide Mercredi, the former national chief of the Assembly of First Nations, said Canada has no right to feel smug about the last 151 years. Canada, he said, needs to find its peace and needs repair. 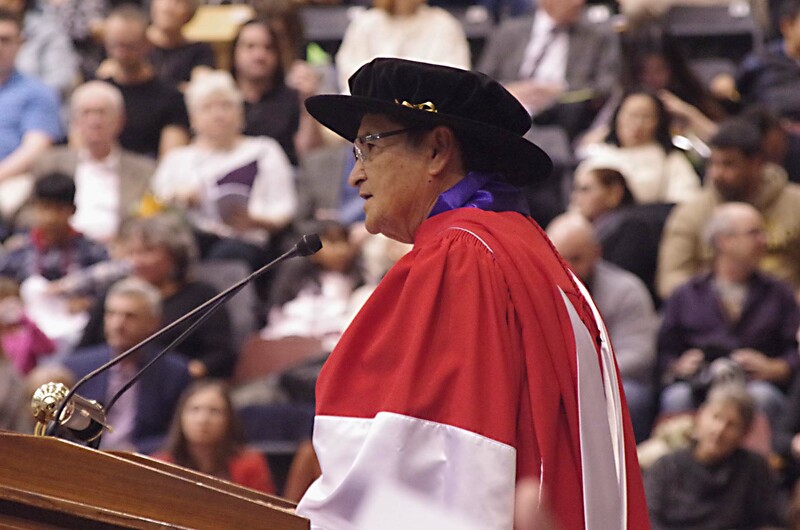 “Canada is a young country… There is a great need and a lot of room for reconciliation,” he told graduates at the University of Manitoba’s 51st annual fall convocation Oct. 17. An honorary doctor of Laws degree was bestowed on Mercredi that day. “Perhaps this change can be your change and one of the common goals we can all share for the future. The best hope for change is through personal relationships,” he told the grads. Mecredi grew up off reserve because his mother lost her Indian status when she married a Metis man. “I was raised to speak my Cree language by my lovely parents, George and Louise Mercredi, and defined my belonging to my Indigenous Nation, the Cree Nation,” Mercredi said. He first faced discrimination in public school when he was told not to speak Cree. “I still cannot understand what this prohibition of my language had to do with education,” he said.